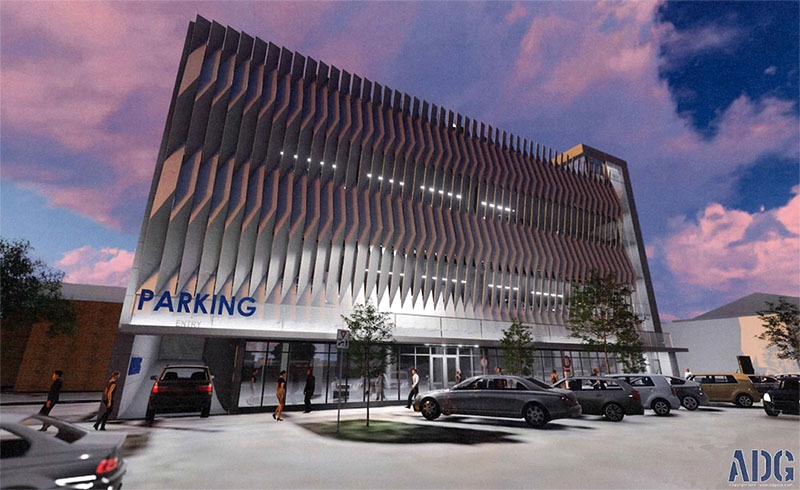 A large surface parking lot directly south of the Civic Center will become a 5-story parking structure with retail and office space on the ground floor, according to plans filed with the city. 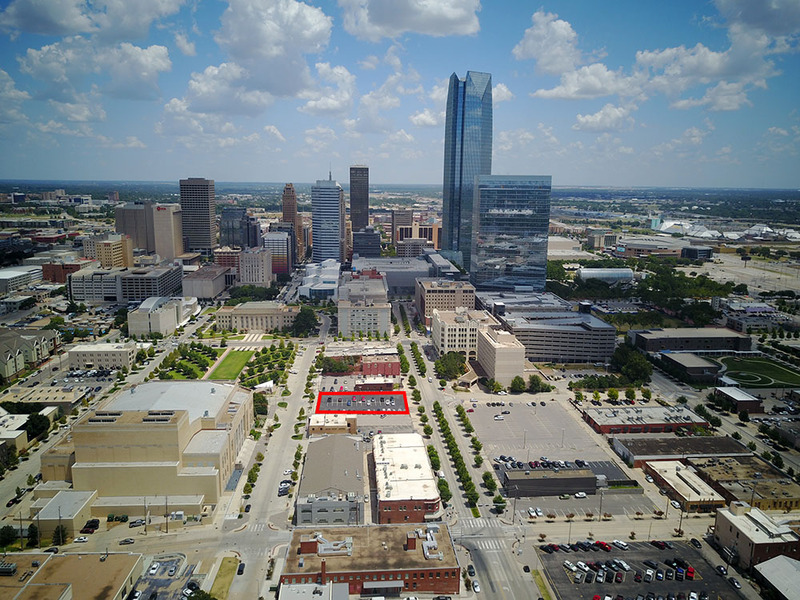 The property at 601 W. Main is owned by the Oklahoma City Police Association, along with several surface lots in the immediate area. 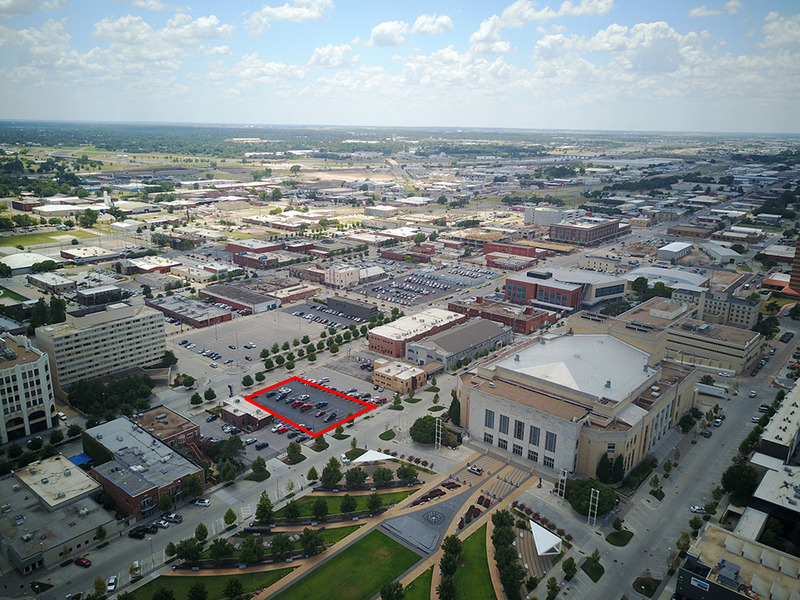 The surface parking has long been seen as a formidable gap between the central business district and the suddenly flourishing Film Row and west downtown area. The Jones Assembly just opened last week at Sheridan and Fred Jones to huge crowds and the prestigious 21c hotel group was the first to blaze the trail on Main Street all the way to Classen, an area that until recently had been run-down and largely abandoned. Now, West Village is under full construction on all sides of the 21c and Jones and in about a year will bring 345 apartments, plus retail and restaurant space. Stonecloud Brewery just across Classen at 1st Street opened last week as well in the beautifully renovated Sunshine Laundry building. This latest project will help bridge the core of downtown with this hot district and will also provide needed parking for another impressive restoration, the Main Street Arcade which sits directly west. 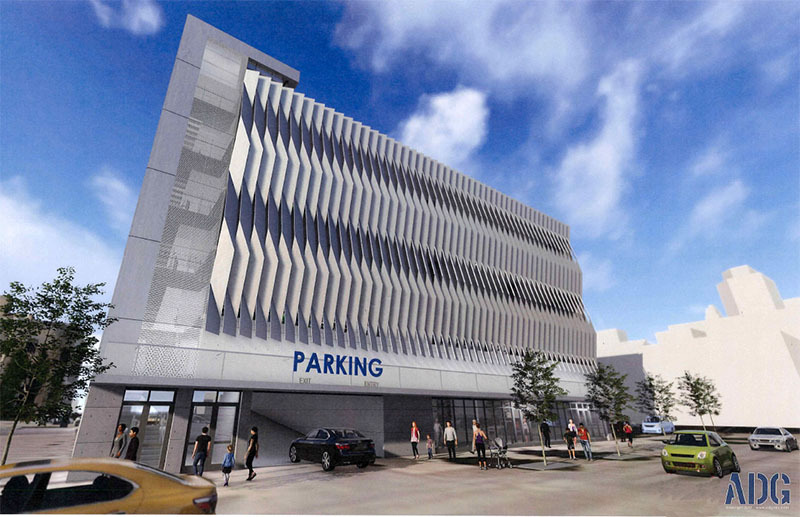 Four levels of parking will sit on top of the ground-floor retail and commercial space at street level. 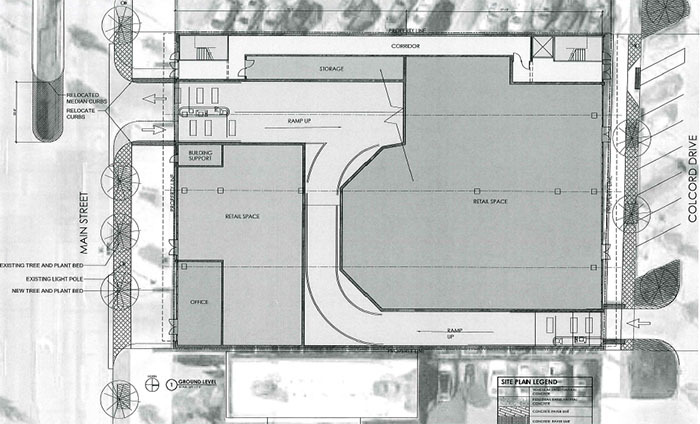 The ADG design and the application by TBL Parking LLC will be considered by the Downtown Design Review Committee. A worthy addition to our thriving Parking Garage District. Actually, it looks okay. It's better than surface parking, and if it helps other places in the area develop, then I guess it's a good thing. Still, it's disheartening that the first of those empty surface lots to be developed just becomes more parking. 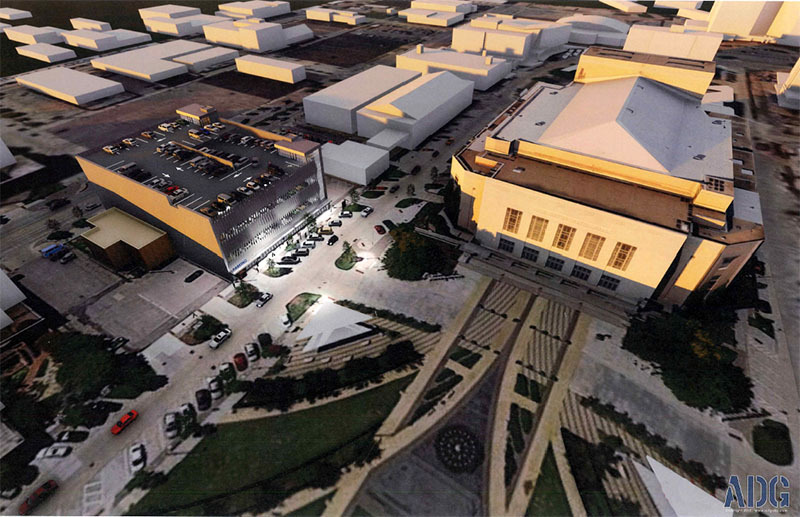 At least it doesn't look like a typical parking garage and will have office and retail space. I never realized how HUGE that parking area to the southwest of that lot is. So much development potential for that parking area. The fact of the matter is that we'll probably have to deal with a few more parking garages being built if we want to get rid of all the surface parking (which I want gone). But hopefully we can get developers in here who will build combination parking and office buildings. A few stories of parking topped by a number of stories of office or living space. The 60s called, they want their Brutalist architecture back. That's a seriously ugly building. That looks like a pretty good addition to me. As said above,the huge surface lot really needs a mid-rise / parking garage to help fill in. Sure, it's not the prettiest building - but it's a lot prettier than a parking lot. This is a start at infill but the area shown in blue below represent a huge gap that is going to inhibit any real connection to the CBD and west downtown. Most of it is owned by the police or city. At least it has commercial space at street level. That's great and should be a requirement for all parking garages downtown. Street level retail would go a long way towards making a lot of these big, boring structures more palatable. This new project would be a lot like the Arts District Garage in that in would have commercial space facing both Main and Colcord. The Arts garage was able to quickly fill what amounted to a considerable amount of space. While it is frustrating seeing more garages (especially since I feel like these are bad investments with self-driving cars coming more quickly than most think), at least there is retail/office space all the way around the first floor. If some of the other garages like Santa Fe had that it would make such a huge difference. Build it and they will come. Sound familiar ? I think it will look pretty cool with the aluminum fins. I am thankful that the design isn't just a concrete box. I keep thinking of my brother-in-law's comment about OKC having more parking garages than skyscrapers. Sigh. It is better than surface parking, but cars seem like they're soon going to be outmoded in urban areas. I guess they can always turn them into housing some day, ala the Waffle Champion building. Parking is like crack. You don't need it, but once you get a little, you can't live without it and you can never get enough! I'm glad almost the entire ground level is what appears to be very usable retail space instead of it being token retail space. Yeah that is very nice. Hopefully this garage will also spur development (hopefully parkingless bc of new garage) on all the surrounding surface lots. Was this garage built to give confidence to developers considering building in the area? strawman argument. Hopefully you weren't being serious. I think what Ross is saying, is that the long rumored idea of an actual Parking Garage District (PGD for short) may finally start to take off. We may be able to finally get that valuable space, all the way from Hudson, west on Main to Classen, turned into invaluable Parking Garages. If we could just line Main St. with these garages, we would only have to wait a year or so before we start developing the PGD2 just south of the Boulevard, on the west frontage of the new park! I love our city's growth and potential for more Parking Garages! I hope someone comes up with a logo. Soon we will need to build a parking garage just to accommodate people who want to come & see the parking garage district. Steve has a story that directly suggests this. Per the story, Urban Renewal has plans for RFPs or something of that effect for the empty lots on Main. This garage is the supposed first "piece" to those lots being developed. BEHOLD, THE PARAKING GARAGE DISTRICT! I am so excited! Doesn't matter it's a strawman argument. This parking garage district is just silly. OKC isnt special with this other than he fact it lacks the amount of garages it needs. Other cities already have these. This is a good development and needed. OKC needs more rail but car based infrastructure will need continued investment as well. Do you think the PGD is a joke? This is big league. Two new restaurants on main st.